The Insurance Institute for Highway Safety (IIHS) has just completed a new round of crash testing on 11 pickup trucks. The 2019 Ford F-150 earned the highest score possible on the important passenger-side small frontal overlap crash test. The small frontal overlap crash test is one of the toughest crash tests performed on American market vehicles by any agency. NHTSA does not perform a test of this type, nor does NHTSA perform crash tests at the high speeds IIHS does. 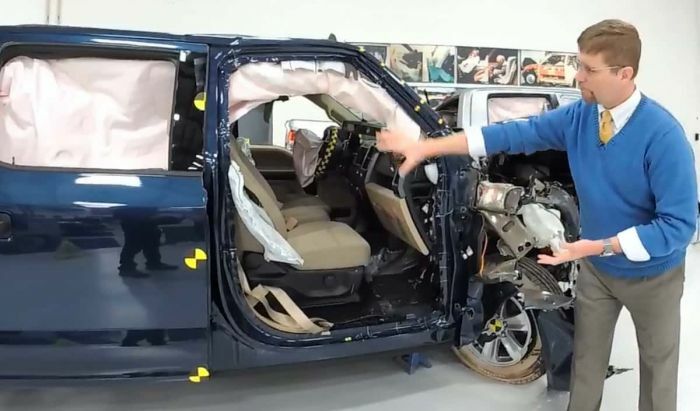 The small frontal overlap crash test simulates a frontal crash where just a small portion of the front of the vehicle impacts a rigid object like a utility pole or tree. Real-world crash data prove that about 25% of the fatalities and serious injuries from frontal crashes of all types are from a crash like the small frontal overlap. IIHS added passenger side testing after it learned through its own experimental testing that manufacturers, Toyota in particular, were only reinforcing the side that researchers tested, the driver's side. As you can see from the crash test summary above, Toyota still has different results on its Tundra on the left and right sides. A close look at the crash test results shows that only the Ford F-150 earns a score of Good on every aspect of the IIHS testing. The Toyota Tundra scores lowest followed by the Chevy Silverado and GMC Sierra clones. Commenting on the latest test, IIHS said in an announcement, "The Ford F-150 was the best performer in the passenger-side test. The structure held up well with maximum intrusion of 5 inches at the rightmost section of the toepan. The seat belts and airbags worked well together to control the movement of the passenger and driver dummies, and neither dummy recorded any potential injuries."